Unleash your creativity (and a little monster mayhem) with these fun Halloween cupcakes. 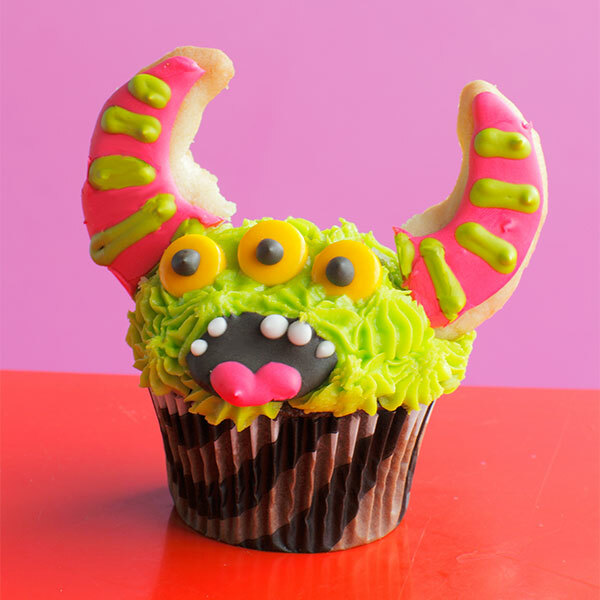 Em's Buttercream Frosting and Royal Icing recipes help you bring these colorful, sweet and spooky monster cupcakes to life. Made with powdered sugar, butter, vanilla and almond extracts, this Buttercream Frosting provides a tasty base for your monster cupcake decorations. Combine butter and shortening together in mixer at low speed until well blended. Add half of the powdered sugar and the milk, and continue mixing at a low speed. Slowly add in the other half of the powdered sugar. Once all ingredients are mixed well, add in the vanilla and almond extracts. Increase to a high speed to “whip” the frosting. You can add more milk, slowly, to get the desired consistency.